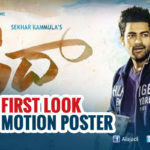 Sekhar Kamula’s upcoming directorial venture Fidaa is making some buzz in the film industry for all the right reasons. With Varun Tej and Sai Pallavi playing the lead roles, Fidaa is touted to be a romantic drama, and the trailer and the teasers released so far promise Fidaa to have a Sekhar Kamula touch. Fidaa is slated to hit the screens on July 21st, 2017 worldwide and the promotions for the film have begun already. The makers of Fidaa have now released a new trailer which indicated what kind of a narrative the film might have. Varun Tej and Sai Pallavi seem to kick-off their encounter with a bitter experience and then later the relation turns to a romantic path. Varun tej seems to be playing a soft-spoken personality while Sai Pallavi seems to be essaying a vibrant and outspoken young girl from a town in Telangana. Sai Pallavi is seen speaking in Telangana accent in Fidaa, which maerks her debut in Tollywood, and the Premam actress seems to have picked up the accent easily. The actress has dubbed for her role in Fidaa and the makers had released a video of the dubbing session in which Sai Pallavi is seen doing her best to get the Telangana accent right. Touted to be a romantic saga and with a tagline LOVE-HATE-LOVE STORY, Fidaa will narrate the story of how a small-town girl from Telangana falls in love with an NRI, and how their relationship shapes up from there. Fidaa is being produced by Dil Raju under his banner Sri Venkateshwara Creations. The music of the film is being rendered by Shashikanth Karthick and will be making his debut in Tollywood.